Popular traditions dating back centuries suddenly put into question. Nations boasting recent and past victories affected in their pride. Enthusiasts of a tough, ancestral sport in revolt in many countries. A selection for survival with criteria difficult to understand. Finally, the interested involvement of a superpower like Russia and an unexpected counter-move by the United States. Geopolitical areas involved: the Caucasus, the former Soviet republics of Central Asia, and the Balkans. There would seem to be all the ingredients for a burst of nationalist fury, but this is a simple Olympic dispute, a storm in a teacup. At least originally, because unexpected implications come up as time goes. The trigger was the decision by the IOC (International Olympic Committee) to reduce the number of sports disciplines participating in the 2020 Games (following Rio de Janeiro 2016). The core disciplines defined by the Committee, which can not be eliminated from the competition, will be reduced to 25 – in fact, 25 plus one. Which one? We do not know. A complex, curious process of elimination and repechage has been adopted to choose it: seven 'minor' disciplines, candidate to exclusion, undergo two rounds of elimination, where judges are the very members of the IOC Executive Committee. The first round, held in May in St. Petersburg, saw four disciplines permanently eliminated – climbing, squash, wakeboard (a combination of skiing and snowboarding), and wushu (Chinese martial art). The three survivors will face the final round in September in Buenos Aires. At the end, only one of them will still enjoy the Olympic spotlight. The procedure itself, with its delays and the inevitable dose of suspense, was enough to put in turmoil athletes, coaches, and club managers, as well as to exacerbate the minds of fans all over the planet, pushed one against the other in a non-sports competition which no one felt the need for. But to make matters worse, an international political and diplomatic dispute was stemmed by the decision to include in the list of subjects at risk one of the most ancient and prestigious Olympic disciplines: wrestling, in its “free” and “Graeco-Roman” variety. But what criteria were used to identify the “non-core” sports? And why wrestling? Criteria are not just technical, but include the popularity of the sport in different countries, the anti-doping policy of the respective federations, the number of tickets sold, and the television ratings. These factors are likely to explain how wrestlers have come close to be pushed off the mat. Surely theirs is not a fashionable sport, at least in many Western countries, and fewer viewers means less sponsorships, and this makes it less appetizing for the Olympic organization and the big business that revolves around the Games. Kostas Thanos, president of the Greek wrestling federation, is adamant: "Should wrestling be abolished, the Olympic Games should be re-named Business Games". Heirs to those who invented both the Olympic and rhetoric contests, the Greeks well understand the importance of lexical issues (think of the dispute with their northern neighbours about the name of Macedonia). Indeed, the modern Olympics – with all their ritual of torches and torch-bearers, collective wobbling, and constant calls for brotherhood among peoples and universal peace – would lose any remaining link with their antiquity if they erased the very key, traditional disciplines. 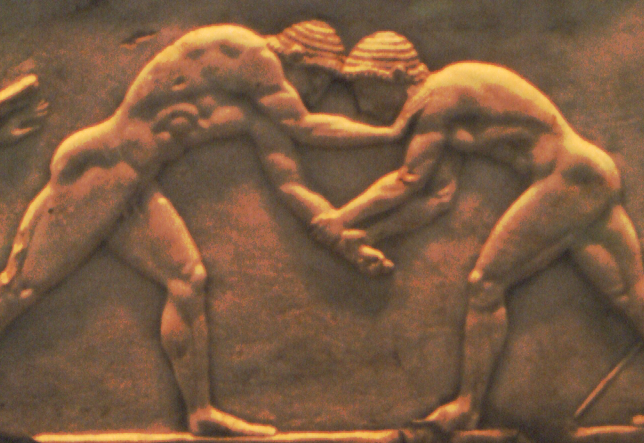 Wrestling was in fact the second sport, immediately after race, to become a part of the ancient sacred contests to Olympian Zeus as early as 708 BC, and always remained in the list of the most prestigious disciplines, worthy of being included among the five showcased in the classic pentathlon (with running, long jump, discus, and the javelin). That's not all – in one indignant official statement, the Greek federation reminds that the official song of the Games (written by Greek poet Kostis Palamas) explicitly mentions only three sports – 'racing, wrestling, and throwing'. It is true that the masses, at least in Western Europe, do not crowd to watch wrestling matches. Wrestlers do not wear expensive brand clothes or sponsor-friendly accessories – they are almost completely undressed and use their bare hands rather than expensive equipment. But this very modesty, combined with the simplicity of the sport, is the reason why this sport is practised by everyone, including the economically disadvantaged kids of less wealthy countries. In addition, its strict rules of conduct require that athletes learn to control those qualities that may negatively connote the discipline – the use of muscle strength, power, and physical dexterity to land and bend the opponent. Matches are somewhat ritualized, illegal catches are far more numerous than those permitted, while it is strictly prohibited to hit or otherwise damage the opponent. In short, it is a discipline with great educational potential, and therefore able to steer away from violence many young people who otherwise have no great prospects for the future. This is why Georgian Kazarashvili, Vice President of the Wrestling Federation, has expressed concern that many young practitioners of modest backgrounds will leave wrestling once it is downgraded to minor discipline and excluded from the Olympics. But what is even more surprising when you take a look at the Olympic rankings of wrestling is the massive presence of Eastern European countries that rarely excel in other sports – for example, Bulgaria, Hungary, Turkey, and Romania place within the top ten worldwide. Furthermore, the whole large family of Balkan, Caucasian, and Central Asian states joined to fight for the recognition of a sport that is part of their historical and cultural identity, and one of the rare occasions of prestige on the international stage. Armenia, Azerbaijan, Georgia, Kyrgyzstan, Ukraine, Uzbekistan, Kazakhstan, Turkey, Bulgaria, Iran, and Mongolia have won most of the Olympic medals in this discipline. A small country like Macedonia won in wrestling its only medal as an independent state, while Azerbaijan preceded the United States in London 2012. In fact, if you look at the map of wrestling excellence, you notice that it runs along a strip of geographical parallels corresponding not only to ancient civilizations, but also to major crossovers between the Eurasian ethnic groups over the millennia. 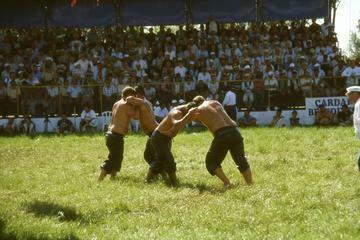 An explanation of the curious phenomenon could be that wrestling, like other martial sports, is a form of ritualisation and sublimation of warlike practices and virtues. Just think of the emperors and armies of Illyrian origin that kept alive for centuries the late Roman Empire resisting the invasion at its borders, or the inroads of the Slavs that almost overwhelmed the powerful Byzantium in the Balkans, but also the waves of conquest by nomadic peoples that from the steppes and plateaus of Asia rushed on neighbouring empires. Georgia may exaggerate about the 'genetic talent' of its young wrestlers, but Rasoul Khadem, Iranian Olympian and now technical manager, is certainly right in remembering that wrestling is not just a sport, but a part of the region's culture and history. According to Mikhail Mamiashvili, President of the Russian Federation, wrestling in the Caucasus is a kind of cult, and above all an opportunity for the youth. The matter reached the top floors of diplomacy and politics with the intervention of no less than Russian President Putin, Judo practitioner himself, who denounced the “unwarranted removal of traditional and fundamental disciplines from the beginning of the Olympic Games”. Immediately following the news of exclusion, Russian Olympian Sagid Murtazaliev returned in protest to the IOC the gold medal won in Sydney in 2000, followed by other famous athletes. It is interesting to note that Murtzaliev is originally from Dagestan, the largest country in the Russian Caucasus – the region that, together with the former Soviet Central Asian states, gave Russia and the former USSR most of the Olympic medals that place them more or less at the same level as the United States, another superpower in the sport. What about Italy? Aside from a decent dowry of medals won by our country, a letter sent to the Chairman of the IOC Executive Committee by the Panathlon International Club of Catania reminds us that in the case of exclusion we would have a lot to lose, even a part of our history: "This Document comes from a region of Italy that has strong historical and emotional ties with combat sports. Sicily, as well as the surrounding area known as Magna Grecia, has always distinguished itself in these competitions. Even before the legendary Milone from Crotone (7 victories at the Olympic and Pythian Games, 9 at the Nemean, and 10 at the Isthmian), the Syracusan Lygdamis distinguished himself in the pankration. 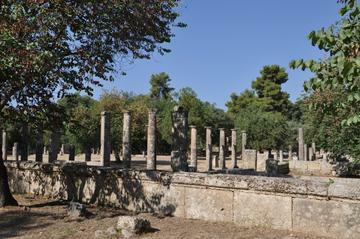 The list of athletes from Sicily and Magna Grecia to win the games at Olympia in various disciplines is over one hundred...". Also Matteo Pellicone, President of the Italian Federation of Wrestling, was strongly critical of the IOC and stated he was "...stunned and outraged. Suppressing wrestling means debasing the value of the very Olympics, delete history, mortify Sport". But sometimes it is history itself, when you deny it, to take revenge by turning into actuality: it happens that two out of three countries bidding to host the Games in 2020 (when the discipline could disappear) are Japan – with its ancient tradition of martial arts – and Turkey, where the yağlı gures, the centuries-old discipline practised by wrestlers anointed with oil, still collects huge masses of spectators. And so, Hasan Arat, head of the Committee for the Olympic Games in Turkey İstanbul 2020, after stressing that wrestling is a national sport in the country, has hinted that it would be a slur for Turkey to host the Games for the first time without wrestling, while for Hamza Yerlikaya, former Olympic and world champion now president of the Turkish Wrestling Federation, eliminating this sport would "break the backbone of the Olympics". But the most emblematic and surprising manifestation of dissent was organized last May in New York, in a prestigious hall of the Grand Central Terminal in Manhattan. Famous representatives of three wrestling superpowers and political foes – United States, Russia, and Iran – gathered in front of a large crowd of spectators and dozens of cameras, in an atmosphere of great cordiality and friendship, just to protest against the impending risk of common exclusion. A large contingent of Iranian supporters was there to cheer not only for the most successful moves, but also for the unexpected embraces that athletes exchanged when leaving the carpet. It should be noted that these same Americans had landed in Tehran a few months before and had been welcomed and acclaimed, incredibly enough, by an immense (Iranian) crowd – so much so that Olympic champion Jordan Burroughs had ironically pointed out that he had felt 'like Justin Bieber'. In short, intentionally or not, this impromptu 'meeting of three nations' sent out an unexpected message, in contrast with traditionalism prevailing elsewhere: that even the strongest fighters can teach the world how to get over prejudices and get along. And so, for a curious set of circumstances, the much-vaunted 'Olympic spirit' of peace and brotherhood among peoples seems to regain life amidst nationalist currents and create alliance and unity of purpose among often rivalling countries: Turkey and Greece, Greece and Macedonia, Turkey and Armenia, Russia and Georgia, Iran and the United States, Armenia and Azerbaijan. In late summer, then, there will be the final choice by the IOC between the three remaining disciplines: wrestling, squash, and baseball / softball. I wonder if judges will seize the opportunity to pay tribute to a noble sport, while avoiding to humiliate a diverse team of small nations with few opportunities to emerge at the global level, and to give a somewhat historical contribution to the emergence, not only in words, of the Olympic ideals of peace and friendship among peoples. Maybe someone might remember how a historical political-diplomatic thaw between Maoist China and the United States took place in the seventies, thanks to a sports match. And that was just ping-pong.